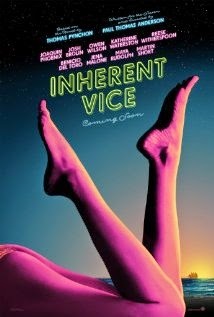 Just saw Inherent Vice. I feel like I can't even be objective about it, because I love Paul Thomas Anderson so much. I love his movies, even if I don't necessarily totally enjoy them--is that weird or what? But now I'm doing my typical ritual after I witness an epic film--going and reading what everyone else thinks about it. It's a weird thing. Opinion is a weird thing. If people disagree with me, it means they're wrong, but that's impossible when you're talking about an opinion, right? No. I don't think that's entirely true. Everyone is entitled to their own opinion, and people can disagree in good faith . . . but I think sometimes people are just mean. An opinion is irrefutable, cannot be said to be wrong, and I think sometimes people get lazy with that. It allows them to be cutting and cruel because they're too lazy to be more incisive and searching. I just came across an example of that, and it made me want to tear every last hair from my head. "Joaquin Phoenix is one of the best living actors, but as Doc Sportello, he’s coasting—digging deep neither into the emotional life of the character he’s playing nor, apparently, into his own, and not subjecting his performance to the pressure of a precise and demanding gesture-repertory. (There are a very few exceptions—a few glorious seconds of physical comedy dispersed throughout the film). Anderson seems happy to let Phoenix merely signify Phoenix-hood and doesn’t nudge him to be Phoenix. The character coasts on the bleary charm of the actor’s line readings and the slouch of his garb: his sideburns seem to be doing most of the work." This is the problem with opinions--people can just say stuff like this. No, no, no, reviewer from the New Yorker, Phoenix was not "letting his sideburns do the work." He was playing a drugged out stoner who had no aim, no clue, no constitution. He was playing the hand he was dealt, playing the character he was asked to play. He played it brilliantly, as he always does, as every other review that I've read asserts. But this reviewer comes along and decided to take a shot at Phoenix and Paul Thomas Anderson because it makes him feel like a big man to do it. Sickening. You're entitled to your own opinion, unless you're an idiot. See? Now I'm just getting downright mean. And inarticulate. I'm blinded by rage. It's a flaw in the medium of criticism--in the name of passing judgment, clever people can be mean and unfair, but masquerade as dispassionate intellectuals merely offering an "opinion." What garbage.